When we’re on surfaces that aren’t properly gripping, we find ourselves slipping and tripping. That’s not an old saying, but it sounds like one, and it might as well be because it’s good advice. Metaphorically, it might mean “when you’re in a situation you don’t have a handle on, you may make avoidable mistakes”; literally, it means tractionless, wet surfaces are an accident waiting to happen. Surfaces near pools tend to be wet, what with all the splashing and water; here are some tips to keep your family safe. 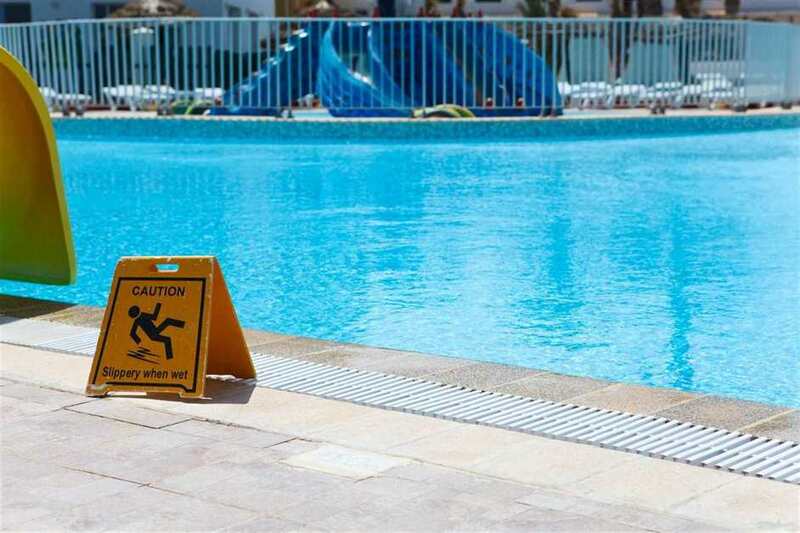 Put signage up around your pool; the sign can be as traditional as those “Caution: Wet Surface” signs, or as cheeky as a DIY sign that says “Hey there’s a pool here the floor around it is probably wet so if you sprint at least aim to fall in the water”. There’s a reason you see these signs in grocery stores trying to dodge liability charges; they’re effective, and sufficient warning means your neighbors probably can’t sue you; it’s worth putting something up! Fencing is a great idea to keep people from slipping; it discourages sprinting at full speed into the pool and makes it harder for little ones to get access to the water when there’s no one around. As an added perk, it stops lusty teenagers from using your backyard for impromptu midnight pool parties while you’re away! Stray animals are also not keen on fencing; dogs have a hard time climbing it, and deer probably think it’s impassable, so you’ll help our four-legged friends from slipping, too! Don’t let the area around the pool look like your weird pack-rat uncle’s garage; clear away pool toys, which should be in the water or packed away in a chest or shed. Lazing around the pool in a lawn chair can be fun, but remember that chairs too close to the pool are a tripping hazard for passers-by; that hazard goes double for the person in the chair, who might find themselves swimming unexpectedly after a collision. Try to set up close enough to the pool that you can enjoy your time with the swimmers, but far enough away that you won’t impact the movement of anyone coming in or going out. Non-slip surfaces are a huge boon for anyone who doesn’t want to be on America’s Funniest Home Videos (which, I recently learned, still airs despite being rendered irrelevant by YouTube). Have you ever passed your hand over a stone, feeling its surfaces, marveling at how it formed? I know that every once and a while, I like to rub a rock or two; that’s handy because Rubaroc might just be the best non-slip surface to contour your pool, combining the durability of rock with the non-slip grip of rubber. You need Rubaroc paving installed by a professional team, and, surprise surprise: we’re the folks to do it for you! We specialize in pool repair and renovation, so installing safety features is a huge part of our business; we trust this material will keep your family safe, and it feels pretty cool, so get in touch!